For those new to the labelling world, you may not know that an adhesive label is not necessarily exactly like another. Having the strongest possible adhesive is also sometimes not the right choice when it comes to picking your adhesive label and may lead to a huge branding blunder – not something you want to explain to your boss. So it’s important to find out exactly which conditions your label will be exposed to as well as what its exact use will be, how long it needs to stick for and on what surface the label needs to affix. 1. Permanent adhesives – these cannot be removed without destroying either the label, the surface that it is stuck to or both. 2. Removable adhesives – these are used in instances where labels need to be removed without leaving a residue, for example price markers on clothes. Sometimes soapy water may be needed to remove these adhesives such as on glassware or crockery. 3. Re-positionable adhesives – Sticky notes are a classic example of repositionable adhesive. 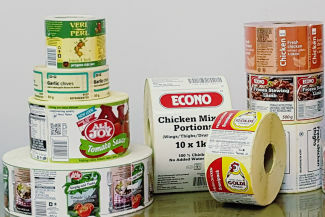 These adhesive labels can be moved time and time again and they will not leave any residue. Their “stickiness” will fade over time. 4. Cold temp adhesives – this type of adhesive is used for products that are stored in freezers and fridges. Knowing what surface the label will be affixed to will determine the type of adhesive needed. For example a label that sticks to a glass bottle, will stick very differently to a leather couch. Tamper evident: There are also other factors that you will need to consider for your adhesive label; for example whether the adhesive labels need to be tamper evident. This means that evidence would be shown if there has been an attempt to remove the label. Price marking labels for instance will tear if you try to take them off the product. Storage: You should also consider how the adhesive labels will be shipped and stored once on the product. If the product will be outside and the label exposed to UV, you should consider an acrylic adhesive label. Acrylic withstands UV and is resistant to most chemicals whereas a rubber acrylic will be used for short term bonding. At the end of the day, your adhesive label needs to stick to the surface it was intended for, for the right amount of time and at the right cost. By partnering with the right label manufacturer with many years’ experience creating adhesive labels, you will be able to use their guidance and advice as to which adhesive label is the best choice for your product. Read here about the fundamental questions you should be asking your label printer. Ideally you want to find a Label manufacturer that you can partner with for the long term. The more adhesive labels they print for you, the more they will understand your needs, timelines and requirements and this will lead to loyalty as well as quality work. The relationship will be mutually beneficial and correctly and timeously printed adhesive labels will be one less job you need to worry about.